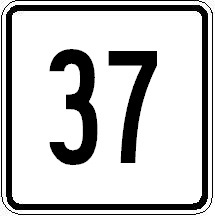 Massachusetts State Route 37 is a north-south highway in Southeastern Massachusetts. It is located in the south Boston suburbs. This highway runs from Interstate 93/U.S. Rt. 1, in Braintree, to Massachusetts State Route 28, in Brockton. Info on MA St Rt 37 is broken down by county below.